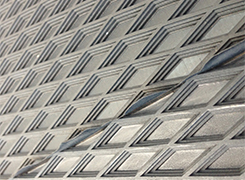 Diamond Top – LEGG Company, Inc.
LEGG Company offers the Diamond Top Impression in different carcass constructions. It can be made from most of LEGG's compounds. If you don't find what you're looking for here, contact us about a belt made just the way you want it. The RMA Grade II SBR with black skims is ideal for the conveying of many products. Its features include a high coefficient of friction and an excellent wear value. XT MOR is ideal for conveying products with mild oil content or a slight amount of oil. It has a moderately high coefficient of friction and an excellent wear. The Grade I SBR has high cut and gouge resistance and is generally used in rock handling applications. Tan Pure Gum offers an extremely high coefficient of friction and is ideal to get incline. It is very flexible and non marking and has excellent abrasion resistance. Tan Non Marking SBR can be used to handle cosmetics. It is very economical and has good abrasion resistance and good cut and gouge resistance. LEGG Company offers a variety of carcass selections in different combinations from fabric plies and rubber skims of polyester, nylon and cotton.